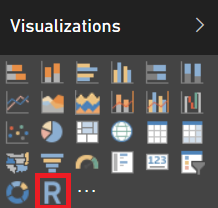 Before we can start using R in Power BI, there are 2 things we need to do. 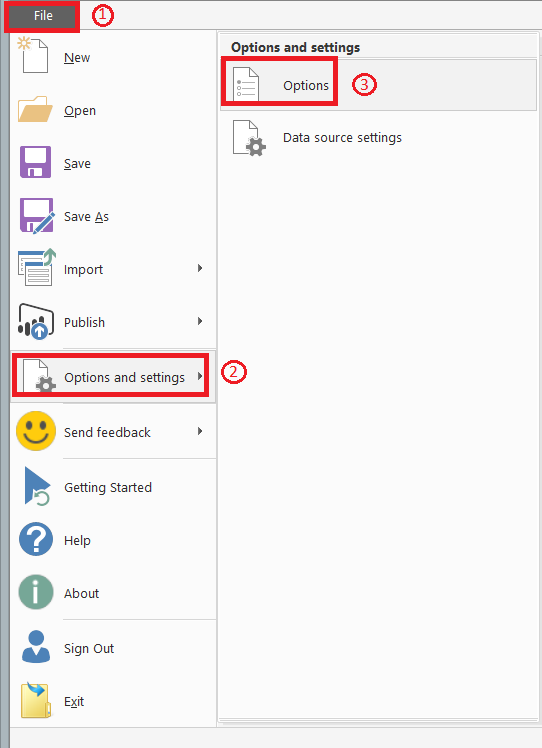 Via the File menu, go to the options window. 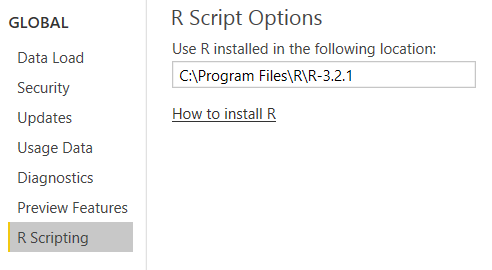 Type the path where you installed the R distribution from the first step. The path you need to type will vary from the screenshot depending on the distribution, version and installation directory. Now you can start using R scripts to create visualizations. You need 2 things, a dataset and a R script. The first thing is something we all have, the 2nd is what we’ll learn here! Let’s get to work with a simple and very common example. Instead of displaying a cool graph, this shows us the following error message. 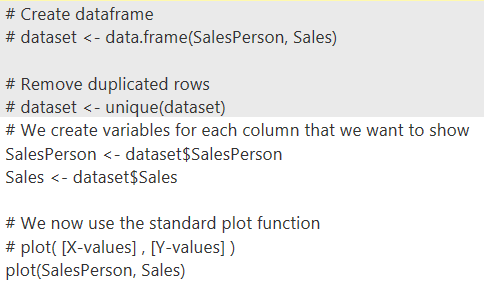 This shows a hard requirement for every one of our R Visual scripts that we are going to create for Power BI. 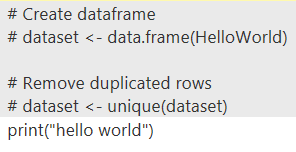 So instead of printing “Hello world” to the screen, we’ll use a simple graph to say hello to the world. 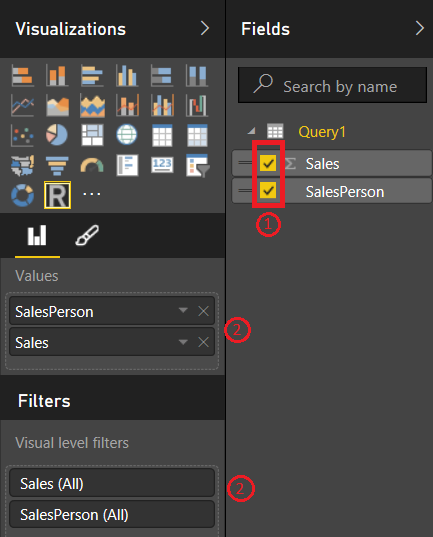 First we need some data, Power BI enables us to enter some data in a familiar Excel style. Just select “Enter Data” and start bashing out some data. After pressed the load button, you’ll see the dataset appear on the right hand side of the screen. You’ll see a blank visualization appear. 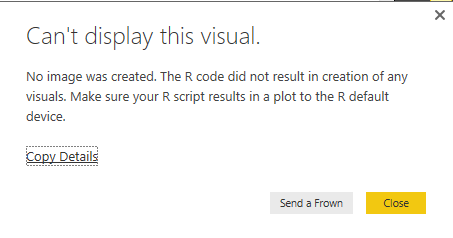 When you click it, the R script editor will appear. But you’ll notice that the R script editor is blank as well. This is where the brilliance of the Power BI team shines yet again. 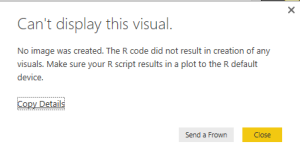 They could have made it very difficult to get that data from whatever source you’re using into an R script visualization. Instead, they opted to keep the already familiar way of working. You simply have to select a (blank) visualization and then select the fields that you’d like to use in it. In our example here, we selected both fields (step 1). 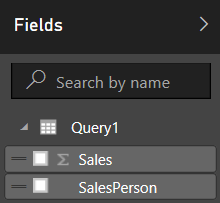 We then automatically see them appear in the Values field list and the Filters field list. This works exactly as we know from regular visualizations. Having selected these fields, something else happend. 3. We can now actually type a script if we want to. Let’s start with a simple visualization. a regular plot. 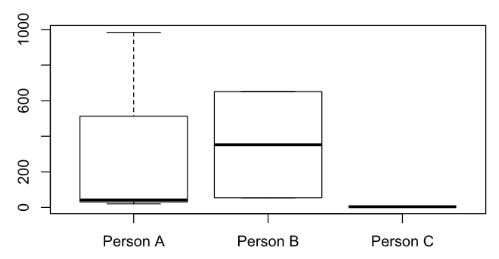 In order to visualize our data, we have to put the fields from our R data into variables. The field that you want to assign to the variable. Below code does all that AND it create a basic visualization using the easy-to-use plot function. If you’re wondering what the hashtags do, I’ll explain. They allow you to type comments that make it easier for others to read your code. And in some cases, they even help yourself when you have to re-read your own code after a while. Let’s give it a makeover! We used the plot function without any options. That’s why we got that simple, quite ugly, graph. But what are all the options that we can use? That’s where the documentation comes into play. Quickly bookmark www.rdocumentation.org so you’ll never forget it! Playing around with all the options can give you a lot of power over your visualization. In this case, sadly enough, we’re very limited by our dataset to create something useful. You’ll have to forgive me for dumping below plot in here, it’s mainly to showcase all the options that were used. It’s very easy to get started with R script visuals, creating beautiful visuals will require a lot of work however. In the end we didn’t create a very beautiful visualization. Like in a regular BI proces, keeping the form of your data in mind is very important. You might need to create custom columns / features or even different aggregations to get the visualization that you need. In my next post I’ll be exploring the new version 2.0 version of the ggplot2 package. ggplot2 is a well known visualization package in R and has a lot more functionality than the standard plot function. If you can hardly wait for the post, go check out this ggplot2 cheat sheet. In the posts after that, we’ll explore some other R functionality that can be used like Machine Learning. But most important, we’ll go from playing around to making useful reports! I’m looking forward to your thoughts and comments. Leave them down below in the comment section, on LinkedIn or on Twitter! Thanks Jan. This was very insightful and you managed to make this very do-able due to the simplistic and concise way you have explained it. Definitely living up to your moto – enabling analytics for everyone. It’s nice to know I’m on target with my goal. Very helpful!! Looking forward to your next tutorial. 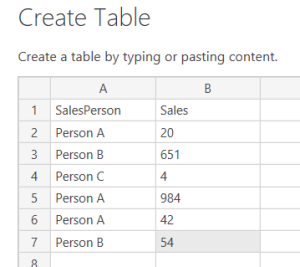 Is it possible to display a table with custom column colors? Because the pb table isn’t very customizable..
Hi Silas, since the april update tables have more options. Does that cover what you’re looking for or do you need something else? great post, helped me a lot to get started! Excellent post! Is this the last part of the series? Would love to see more sections!